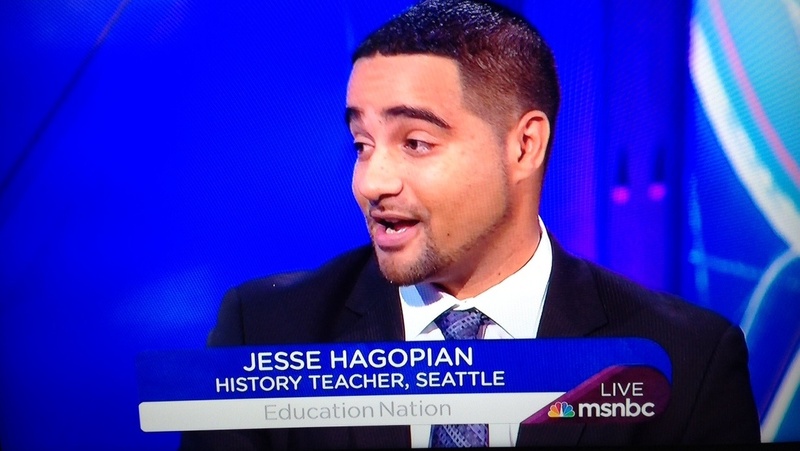 Over the past few months I have traveled around the country to speak to audiences about the lessons of the historic victory of the Seattle MAP test boycott. Since spring break, I have spoken at the AERA academic conference in San Fransisco, at a high school in Portland with test resisters, to the teacher’s union and Rethinking Schools in Milwaukee, with the CTU president and at the Socialism 2013 conference in Chicago, with the MORE teacher caucus in New York city, at the Advancement Project’s convention in Washington, D.C., and at the National Education Association’s conference/RA in Atlanta–with trips to D.C., Minneapolis, Eugene, and beyond still to come. So far, the tour has been a major success. Between all the events I have spoken at, hundreds of parents, students, and teachers have attended, shared powerful stories of their own resistance, and asked thoughtful questions to figure out how they might build a more powerful resistance. School districts around the nation have reason to worry about the explosion of boycotts and opt-outs against the tests next year! In Atlanta I spoke to at the National Education Association’s Joint Conference on the Concerns of Women and Minorities. Here is an interview I did there that aired at the NEA Representative Assembly. In Washington, D.C. I spoke at the Advancement Project’s national forum (Preview) , “We Can Do Better: Collaborating to Reform School Discipline and Accountability”. 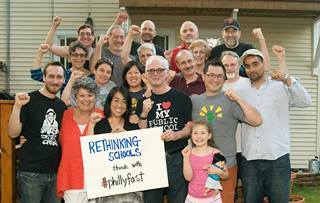 This was an incredible gathering of some of the best activists and educators from around the nation involved in ending the school-to-prison-pipeline and organizing opposition to standardized testing. You can view my speech, “A View From the Front Lines”, here. I spoke alongside Chicago Teacher’s Union president Karen Lewis in the spring and then returned to Chicago to speak at the “Socialism 2013” conference on a panel of social justice education activists–including Chicago Teachers’ Union Vice President Jesse Sharkey, Brian Jones, Malcolm London, Asean Johnson, Jen Johnson, Megan Behrent, Israel Munoz, Rousemary Vega, and Sherise McDaniel. You can view the forum here. At the same conference I participated in a workshop session with Julie Fain and Stephanie Rivera, available here. Stay tuned for a stop near you!